Intuitive Decision Making - The Abrupt Decision. William James described the intuitive decision making processes of the mind. He wrote of a person, getting up from a warm bed on a cold winter morning. Cozy warmth under the blanket competed with shivering cold signaling the day's drudgery. The lad lay unable to brace himself to get out of bed. Then a sudden decision was made. William James called it a lucky idea, which "awakens no contradictory or paralyzing suggestions, and consequently produces immediately its appropriate motor effects...." Abruptly, negative feelings were stilled and he got quickly out of bed. James called it a shift from "wish" to an act of "will." How does the mind make a swift intuitive decision? Science suggests that the nervous system contains a hierarchy of intelligent decision systems. Homeostasis experiments revealed the existence of these independent and cooperative self governing entities. Higher levels in the system made more effective decisions. Within the triune brain, the mammalian and reptilian brains managed adequately, even if RI, the human level prefrontal regions were cut off. There are no current theories about intuitive decision making. But, the Kezwer approach can enable you to understand the process through a few thought experiments. Your experiments will reveal that conscious decision making has clear limitations. Emotions make the decisions of the system. Nature evaluates priorities between myriad competing and conflicting emotions and grants control of the system to a single family of emotions. The spinal cord also manages conflict between opposing muscles, with coordinated action. The neural circuits of the limbic system, the seat of emotions, resemble the spinal cord in having feed back and feed forward circuits. Francois Jacob noted that evolution follows a habitual path. It has applied feed back and feed forward controls within the limbic system for the coordinated control of emotions. Combinatorial coding can produce intelligent decisions, while accommodating a galactic evolutionary wisdom. 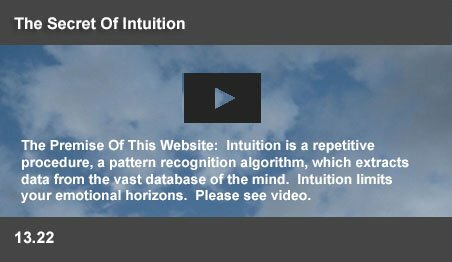 Effective mind control seeks to manage the intuitive decision making process by granting control to RI. Your mind contains an assembly of intelligences, in a triune brain accumulated by nature over millions of years.Medical research suggests that these entities function in a manner similar to the governing processes of a country. At the lowest levels, individual actors make their own decisions. Higher level decisions are made by the communities, by the state governments and finally, by the central government. Experiments on the "homeostasis" of animals revealed the roles of these actors. Homeostasis is the achievement of equilibrium by the organs (the actors) within the body, in a changeable environment. Individual actors supervised various sensing, feedback and control systems. By studying the effect of destroying localized target regions in animals, science identified the pivotal roles of these actors. As higher levels were included with the spinal cord below the cut off section, the system made more effective decisions. Within the triune brain, the mammalian and reptilian brains managed adequately, even if the human level prefrontal region was cut off. The real you, RI,exists in this region, above the thalamus. But, your emotions, triggered from the levels below, generally make the decisions, which manage your life. The homeostasis experiments revealed that if the (RI) levels above the thalamus were cut off, the intelligences below could manage a wide range of activities including “feeding, drinking, apparent satiation and copulatory responses” in a broad range of adverse conditions. Evidently, RI, (you) in the prefrontal region, plays a minor role in intuitive decision making. The system can manage quite well without you! Since there are no established theories about intuitive decision making, it is useful to look into your own mind to see how your mind makes its decisions. Glen Kezwer advocated using your own mind as a research lab to study experience. "The cost to the government exchequer and the people is nil, no research grants need be applied for, no progress reports are necessary and there is no need to be concerned about the renewal of funding. There is also no pressure to publish papers, technical reports or books on the experiment." This article suggests that you could try a few of these mental experiments to understand intuitive decision making. You are RI. Normally, you believe that you make the decisions of your mind. You think you can raise your arm, using your will. As soon as you will it, your arm goes up. But, suppose you are in an elevator with other passengers. Then, it is inappropriate to raise your arms. If you will this action in that situation, it will not happen. Actually, your intention will be overruled if your action is not Worthwhile, Appropriate, Safe, or Practical (WASP). Many of your good intentions are ignored by your mind on the Worthwhile consideration - like reading a report, when you are sleepy. Appropriate - you will not wink at a stranger. Safe - Not jump off the high diving board. Practical - attempt to learn Greek. In every WASP case, your mind has overruled your will. So, obviously you do not make the final decisions of your mind. When you carry out your WASP tasks in life, many emotions compete in your subconscious. Have you not sometimes been seething with anger below, while being polite outside? Have you not had the urge to go off on a holiday, while going to work? Your actions are controlled at any point by one of many emotions. Fear, sadness, disgust, contempt, curiosity, surprise, love, pleasure, embarrassment, guilt, and shame are some of the major emotions which impact your behavior. Your emotions compete with each other. Each has a blinkered view. Anger cannot respond, if the action is not appropriate. With its deep wisdom, nature evaluates priorities and grants control to a single emotion at a time. Your emotions are triggered from the mammalian region of your brain. Also called the limbic system, it contains a ring of interconnected neurons with over a million fibers connecting the thalamus, the hippocampus, the septal areas, the amygdaloid body and the insulae. These regions prioritize and trigger your emotions and feelings. The ring of fibers, which connect these organs shares a common feature with your spinal cord. Both make complex and interdependent decisions. Both these massive neuron channels have feed forward and feedback links. That feature provides the answer to the decision making processes of the mind. The spinal cord fine tunes the final decisions of 60,000 motor neurons, which control your movements. Muscles can only contract. When one muscle relaxes, an opposing one contracts to open your finger, or to bend your elbow. Thus, when you sit down in your chair, your movements are controlled by muscles, which contract, or relax, upto 10,000 times a second. Each motor neuron in the spinal cord has upto 20,000 interneurons, which report to it the movements of other muscles. These are feed back and feed forward links. Feedback links inform the muscle of actions already taken and feed forward links, of actions about to be taken. 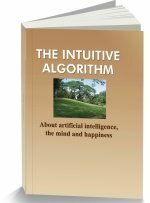 Intuitive pattern recognition enables the spinal cord to coordinate these complex interactions, where all muscles contract, or relax in harmony. The spinal cord has a neural mechanism, which can finely coordinate complex and opposing neural interactions. The limbic system has a million fibers, which carry a massive range of complex emotions. Emotions essentially fall into two opposing categories - agreeable, or disagreeable. Nature required a system, which could finely coordinate opposing impulses to deliver a smooth output. Francois Jacob had noted one unique quality of evolution. “In contrast to the engineer, evolution does not produce innovations from scratch. It works on what already exists, either transforming a system to give it a new function or combining several systems to produce a more complex one.” Nature uses the feed forward, feedback links in the spinal cord again in the limbic system to decide your current emotion. If an animal felt both hunger and thirst, it could not stop undecided between its urge to eat and its need to drink. A single decision to act was indispensable. The final emotion decided the action. The decisions of the limbic system depended on massive memories. Codes, which could fill cubic miles of 500 page books, set the contextual priorities from millions of options for the limbic system in decision making. Any action, which is not WASP (worthwhile, appropriate, safe, or practical) is to be instantly inhibited. A searing emotion indicates a serious problem for the system. That emotion is immediately assigned control. Paul Eckman, the famous emotions scientist wrote "We become aware a quarter, or half second after the emotion begins. I do not choose to have an emotion, to become afraid, or to become angry. I am suddenly angry. I can usually figure out later what someone did that caused the emotion." The limbic system decides, whether you should be angry, or afraid. Intuitive Decision Making - No "Ghost Within"
Does this article suggest there is no free will? Surely people have the powerful ability to initiate, cause, activate, begin, create events? Is that amazing competence merely pattern recognition by nerve cells? Who initiates all this activity? Is there not a consciousness, an “I” with a free will, which controls his/her actions? NO! Engineers who program a production line are familiar with automated decision making. A machine picks components from a conveyor. It identifies each component and deposits it in its proper bin. The machine makes its choices and acts. Because it is designed to make choices and act as long as it is switched on. Free will is just an automatic mechanism which triggers the next highest priority activity of the system, while the system is awake. The "initiation" is merely a switching process by the limbic system, which selects the most powerful emotion as the current motor control option. And, you cannot move a muscle, or even focus your attention, if the system decides otherwise. Emotional interpretations by the limbic system depend on the final evaluation of an event. Often, there are conflicts in internal recognition messages. In such cases, the anterior cingulate cortex (ACC) has been noted to become active. Such activity has been observed in the ACC, when a subject solves recognition conflicts in the “Stroop Task.” In this task, a subject is required to name the color of the ink for the word “RED,” written in blue. Here color recognition conflicts with word recognition. ACC is believed to evaluate and settle such conflicts. The system has to decide whether a garden hose, or a snake, is seen behind the bush, before triggering the fear emotion. Emotions are triggered after the resolution of such conflicts at higher levels. It is ACC, which settles the conflict and switches off fear at its roots, if the object is actually a garden hose. Such error detection and resolution does not involve executive functions. Lesions in the ACC do not cause a loss of executive functions. Located in the prefrontal regions, RI is the real you, the unemotional rational human level intelligence. With its vast inherited and acquired wisdom, it knows what is right for you. When RI is in control, you have effective mind control. Unfortunately, a more primitive mammalian brain, the limbic system, decides who should take control. Its priority is the most vociferous emotion. The limbic system is the powerful decision making part of the human brain. It stands between RI and a rational world. Will power usually fails. So, raw animal emotions rule a tragically large part of human activity. Wise men across history sought ways to still emotions. Only a still and calm mind can put RI in charge. This website suggests Mind Control Tips to still emotions and place you in charge.